Lena's practice integrates the caring support of a doula and the ability of massage therapy to calm and relax the body and mind and reduce pain and anxiety. Her unique combination of training as a licensed massage therapist, clinical herbalist, birth doula, lactation counselor and childbirth educator (as well as studies in infant massage, nutrition, psychology, women’s & gender studies, cupping therapy, hydrotherapy, and aromatherapy) make her a great addition to your birth team. She is a progressive and non-judgmental doula who has experience supporting LGBTQ+ families, single parents, and non-traditional families. She has been attending births for a decade at homes, birth centers, and hospitals throughout New York City. She teaches holistic childbirth education, newborn care and breastfeeding classes at Bend and Bloom Yoga in Park Slope. She is currently a part-time faculty member at the ArborVitae School of Traditional Herbalism in Manhattan where she teaches courses on herbal therapuetics for female reproductive health and the musculoskeletal system. Lena is a member of the Board of Directors of the Childbirth Education Association of Metropolitan NY (CEA/MNY) and also teaches classes on Perinatal Nutrition and Labor Support in the CEA/MNY Teacher Certification Program. She has also supervised student massage clinics, taught massage courses and written prenatal massage curriculum at Queensborough Community College in Bayside and the Finger Lakes School of Massage in Ithaca. Before moving Red Moon Wellness to Park Slope in 2009, she lived in Ithaca, NY where she originally opened her practice. 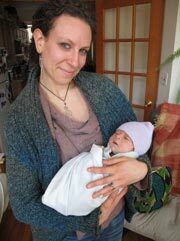 Lena was certified as a birth doula by homebirth midwife and educator Susanrachel Condon of Niara Healing Arts. She also completed an advanced doula training with legendary midwife, Ina May Gaskin and renowned doula instructor and director of the film Orgasmic Birth, Debra Pascali-Bonaro. She was trained as a lactation counselor through the Healthy Children's Center for Breastfeeding and is certified through the Academy of Lactation Policy and Practice. 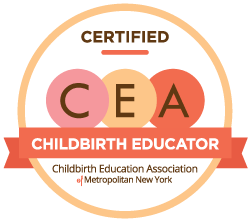 Lena was certified as a childbirth educator through the rigorous 2-year certification program offered by the Childbirth Educatio n Association of Metropolitan NY (CEA/MNY). Lena studied massage therapy at the Finger Lakes School of Massage in Ithaca, NY where she was also trained in hydrotherapy and essential oils, and is a NY State Licensed Massage Therapist. She began studying herbal medicine a decade ago, first through two apprenticeships (at Alba Nueva herb farm in Costa Rica with Dr. Ed Bernhardt and the Heartstone Herbal School near Ithaca, NY) and then went on to receive a Master of Science in Therapeutic Herbalism from Maryland University of Integrative Health (formerly known as Tai Sophia Institute), where she also completed a one-year post-graduate clinical internship at the university's Natural Care Center Clinic. Prior to obtaining her master's degree, she completed a Bachelor of Arts with Highest Honors in Psychology and Women's & Gender Studies from Rutgers University in New Jersey. While at Rutgers she also studied French language and literature in Paris, France and regional politics in Zagreb, Croatia. Lena worked as a coordinator of a community education program on gender-based violence as well as on a domestic violence response team in New Brunswick, NJ. She also directed a variety of community-based campaigns in New Brunswick where she worked on issues relating to human rights, education, peace work, and a number of local community issues. She lived and worked on a few different organic farms and eco-villages in Costa Rica where she studied tropical herbal medicine, organic gardening and permaculture principles, holistic health, nutrition, massage therapy, and Spanish language.